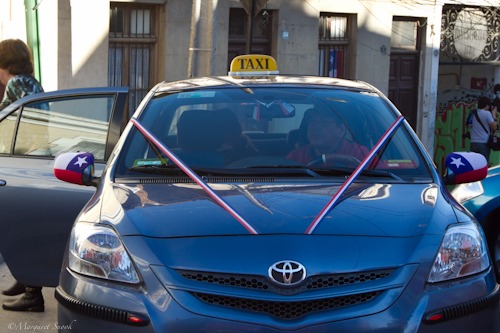 I’ve written about talking with Santiago cabbies in the past**, and even though I haven’t written much of anything lately, I continue to gather material nearly every time I hop into a cab. In fact, I could probably do an entire blog on taxi tales! And so it went the other day… with a twist. When we got to the part about kids and I explained that we both had kids from our respective previous marriages but none together, his head whipped around to look me in the eye. Insert the word quizzical somewhere in that sentence… give it about 2 seconds, and then change it to judgmental. “That’s selfish,” he pronounced. My eyes snapped to his, but I didn’t respond. I’d heard it before. “When you get married you’re supposed to have kids.” He’s right. In Chile, it’s the law—it’s written in the Libreta de Familia—the legal document that is proof of marriage and requires couples, among other things, to procreate. He cleared his throat and checked for oncoming traffic before making a turn. “There’s nothing better than a house full of kids—todos que Dios manda—all that God gives you.” It’s a frequently repeated mantra here, especially among the church-going over-40 crowd. I held my tongue. Even though part of me was doing a double-taking what-the-hell kind of seethe at being judged on such a personal matter by a total stranger, another part decided it was just way too early in the morning to get into it with him, and yet another resolved that there was no reason I needed to justify my life to a total stranger. This entry was posted in Everyday Life, Expat living, Family * Familia, Transportation and tagged gotta have kids, purpose of marriage, Taxi Tales, the more the merrier. Bookmark the permalink. Hi, Margaret; I missed your posts. It’s amazing how those topics (like the-North-Americans-less loving, etc.) are still around. Many of us have lived in the States, and can testify to the contrary. Yes, this guy was 50-something-ish. And yes, these topics are still very much alive and kicking. He took me off guard because I haven’t had this argument so personally directed at me by a total stranger in a while. Maybe just because I’m no longer of an age in which people expect me to keep having babies. I bet younger women still get it fairly often. About who is more loving, Chileans or North Americans, as I’m sure you know–it’s just different–doesn’t make it more or less, just a different approach to loving those around you. It can be very infuriating, not only to a gringa but to anybody, to have to face such a close-minded statement from a total stranger. Since I was born and raised in Chile, I can say with a high level of certainty why the driver made such comment. Generally speaking, the Chilean population does not reach the same level of education as that in the more developed countries. Also, and until very recently, most of the population had very little exposure and direct contact with foreigners, leaving most Chileans with a single view of the world. As a Chilean it does not surprise at me at all to hear that type of situation take place. Fortunately I’ve had the privilege of learning to appreciate and to be tolerant of other people’s views and beliefs. We can only hope that in time and with the help of better education, the population will grow to accept and understand that there are other ways to behave besides the ‘Chilean way’. Hi John- I don’t mind that the guy has his opinions and beliefs–was just surprised that he pronounced them so assertively. On the other hand, I do enjoy these brief encounters with strangers (cab drivers) in part because it DOES allow me to get some insight into what others think–on the flip side, he also got a bit of insight into what I, a foreigner in his country, think. Works both ways! Welcome back, Margaret! I’ve never been questioned about why I only have one child, but people here are usually shocked that I am here “alone.” For them, it’s practically inconceivable that a woman would leave kith and kin and head off to live in a foreign country. Hi PiP! What a great idea!! Here in Dubai, this is what’s the typical Taxi ride as well! Most of the drivers here are from Pakistan or India, I always interrogate them, the other way around! And do they ask YOU questions as well? It’s such an interesting opportunity to share the stories of two people whose paths may never cross again, isn’t it? Yes indeed, most of them are chatty. At the same time, they look at Filipinos as friendly and accommodating, that’s why they often ask questions. It is always interesting to share stories to someone you might not meet once again…. Thanks, I will! And I’d love to hear some Taxi Tales from your part of the world too! ¡es que hay gente muy metida, desgraciadamente! Años atrás muchos me trataban de hacer entender que era una insensatez tener un sólo hijo. Hay un dicho para estos comentarios fuera de lugar: “hay que tomarlo como de quien viene”. Muchos saludos. It´s true that “North Americans” may show love in different ways, etc etc but based on my 1 year living in Chile, I´d say that a culture where you greet cualquier women with a kiss on the cheek or any man with a handshake/hug… vs. the states where its a handshake with women or even just a head nod to anyone .. on the surface level doesn´t that statement seem correct? I guess I don´t really understand why you say “sigh…”, maybe that alludes to past conversations you have had or whatnot. Also it´s interesting–the few times I took a cab (I used mainly los micros, el metro, los colectivos) hardly anyone struck up conversations with me, actually that mainly goes for my whole experience in Chile–I always had to initiate a conversation, which I´m not saying is a bad thing. Perhaps because I am a male or have a darker-complexion which may come across as being a “chileno cuico”, but I have heard females who look “gringa” their experience is always different. Perdón if my comentarios come across as condescending o lo que sea, just my impressions! Que esté bien. Thanks to this blog I am getting to understand the Chilean mind a lot more. Several years ago, one of my Chilean cousins came to visit. I had never met her. Of course, I tried to be the good host and although she was staying at my parent’s, I would pick her up most evenings after work and drive her to different landmarks. Firstly, I found it a bit uncomfortable that she would hug and kiss me on the cheek every time I picked her up and every time I dropped her back at my parents’. On her last day when we said goodbye, she said to me that she was very happy to have met me and the rest of the family, but she “just had to tell me” that she felt that we were so cold. This was a bit of a shock to me as I had never given a thought to whether we were cold or warm. But clearly, they have that image of us perhaps because we do not into great visual displays of our feelings and emotions. Just another thought on your cab driver. I wonder what he would make of my marital situation. I am in a de-facto relationship (legally binding in my state). My partner is Chinese, and we have both decided never to have children. The correct answer to the question “Do you and your husband have children?” is “We total x children” (Tenemos x hijos entre los dos). I don’t think anyone would ask for a detail of los míos, los tuyos y los nuestros. oh wow!! I’m expat living abroad in Germany, and I would say that the Germans are also pretty known for giving their opinion without being asked, but nothing this extreme! More like, if you are walking with your baby and they don’t think the child is dressed correctly (such as too many clothes in the summer or too little in the winter) they’ll stop on the street and tell you. But nothing like you described!